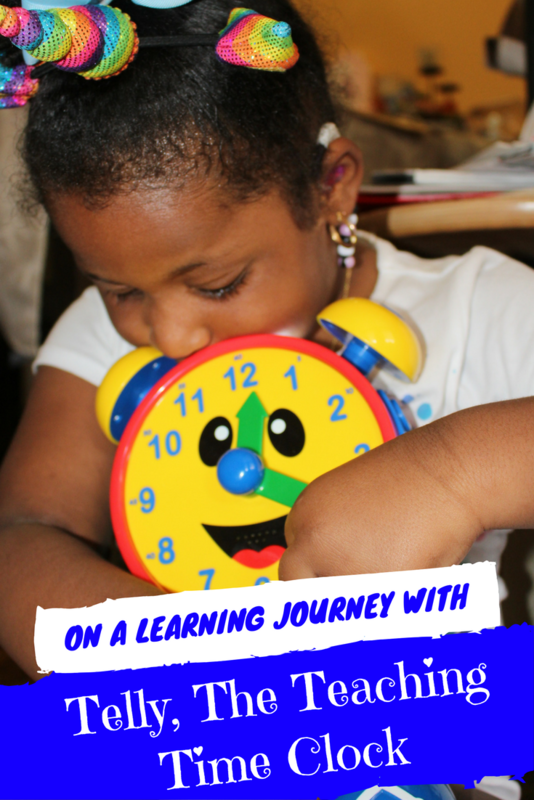 On a Learning Journey with Telly the Teaching Time Clock! We received product in order to facilitate this review. All opinions are our own. Educational toys are always a must in our household. Yes we have a bunch of random silly toys too, but nothing compares when it's time to learn. 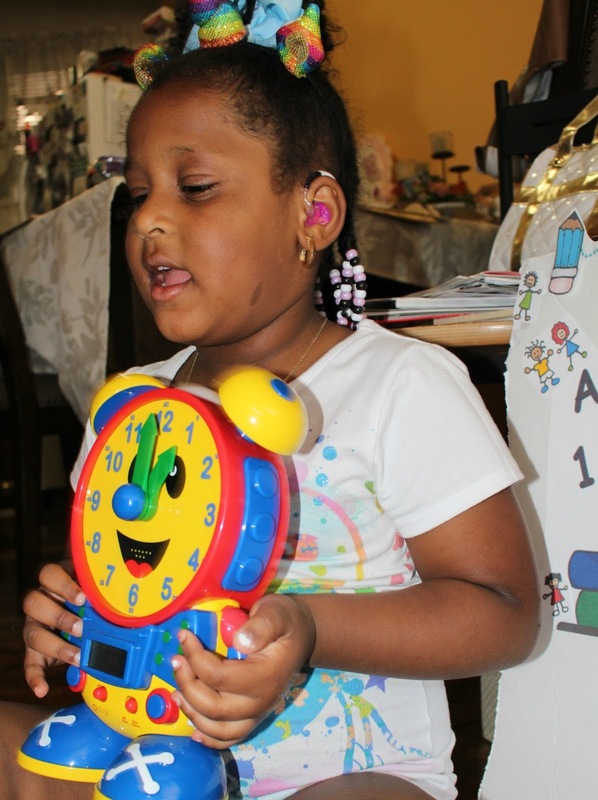 Gabby Turned 4 in January, so she missed the december cut-off to attend Kindergarten in September. Though she's been in a UPK classroom since age 3, She'll be officially starting it in it's entirety this fall and I want her to be ahead, even if it's just telling time. Telly the Teaching Time Clock is as cute as can be and does amazing things! QUIZ MODES - to help with learning analog and digital time. Telly either tells your child the time that they have moved the hands to OR he'll ask you to turn the hands to a specific time in which they get 3 tries to get it right. Even if all three tries are wrong, there are no discouraging sounds. It's just a cute Telly telling them "It's ok, Let's try another!" REAL TIME - The clock works as a real Digital clock. Gabriella likes to stop at random moments throughout the day to match Telly's Face with our wall clock and she then reads out the Digital clock on Telly's bow. Do note that the clock's hands move in 5-minute intervals and not the minutes in between so although the Time on Telly's face can't read 9:23am, Your child can set it to 9:20 or 9:25 and be just as happy to get it that close. TIME SCHEDULE - Gabby still gets the big and little hands confused (I mean duh, she's still young) but she'll get better. I'd tell Gabby "You have to go to bed when the Home clock and Telly's face match. That would mean it's 9 o' Clock." At that point I would set Telly's Face to 9pm and just let Gabby play or do whatever she's doing, but check the clock every once in awhile. It was working very well until she remembered she could move Telly's Hands too. NIGHT LIGHT - Self explanatory there... Telly has a glowing light that you press at the top of his head at bedtime if your child doesn't like the dark. Gabby loves Telly and he's become her Buddy. She plays with him each and every day even if only for 5 minutes at a time. I can see that she's ACTUALLY learning and that puts a smile on my face. Telly comes in Primary Color and also a Pink/ Purple version. Its less than $25 Price Tag makes it the perfect price for something truly educational. These make MUCH greater gifts than mindless video games and loud noise makers... TRUST ME, Parents will appreciate you! Oh my gosh, that is so cute! What a great way to make learning time super fun. What a cute and fun way to teach the littles to tell time. My son would enjoy this. That is such a fine way to tell time. I love that it has both analog and digital! The nightlight is a bonus too! Awee this is cute! It is amazing how many kids today do not learn how to tell proper time with all the tech we have. What an adorable clock. I can't imagine any kid not wanting to learn to tell time with such an adorable toy. This is so cute! I had a similar toy when I was a kid. You can't beat a toy that is both fun and educational! As a grandmother I am aways looking for educational toys. This would be perfect and a great way to start to learn how to tell time. What a fun way to learn about time. I want to get this telly clock for the twins. This looks like a great resource to get kids learning how to tell time. My boys are working on this skill right now and it is so fun! This is a cool way for kids to learn how to tell time. My youngest didn't really learn until this year. We only had digital clocks which makes telling time easier. I've never heard of this but I'm sure it's so cute and fun for kids! That is the cutest name! I love educational toys, this would certainly make an awesome gift for a little one! This sounds like such a great idea for kids! I love these educational toys for kids, they're great! I have to check it out for my nephew. I bet he would just love it! It's really a great idea to invest in educational toys for our children. I also love to give toys like this to my nephews and nieces. Wow this toy looks like so much fun! I love that it helps kids learn, but also is fun for them. That's really the best part! Such a great toy! Whoa! This is really great toy. My son will surely like this. This clack looks like a great tool to teach kids time!! My niece would love one of these!! That is a great toy to use to teach kids to tell time. I'll have to check this out for my nieces. That's the one things I haven't gotten around to, teaching my littles how to tell time. This is a perfect toy.